Egon Schiele has long enjoyed a cultish following, and his brief life has all too frequently been mythologized. His early death, his fascination with taboo subjects, and his consequent prosecution have prompted biographers to portray him as a martyr to bourgeois morality, a sort of fin-de-siècle rebel with a cause. However, the real Schiele was a far more complex character: true at heart to his middle-class roots, but naively convinced that artistic genius guaranteed him immunity from the strictures of conventional propriety. Not yet twenty when he created his first Expressionist canvases, he possessed an artistic maturity well beyond his years, and as a result he captured the pangs and obsessions of adolescence as no artist before or since ever has. Lacking adult inhibitions, Schiele was able to confront the nature of human existence, including the struggle for identity, creativity, sexuality, and the inevitability of death on the most profound level. Schiele’s interest in such weighty themes--expressed most directly in his allegories and his landscapes--derived in part from the Symbolist tradition exemplified by his sometime mentor, Gustav Klimt, and in part from his own early encounters with death. As the son of the stationmaster in the provincial Austrian town of Tulln, Schiele had enjoyed a comfortable childhood, but his father suffered secretly from syphilis. An older sister died, probably of the disease, when Egon was three, and his father finally succumbed in 1904, when the artist was fourteen. Schiele, always an indifferent student, at this point immersed himself completely in his art. After being asked to leave secondary school in 1906, he defied his family’s wishes and obtained admission to the prestigious Vienna Academy of Fine Art. However, he soon tired of the conservative academic regime, and after Klimt invited him to exhibit in the 1909 “Kunstschau,” Schiele and several classmates cut their ties with the Academy by issuing a formal letter of protest that guaranteed their expulsion. Dubbing itself the Neukunstgruppe (new art group), Schiele’s clique had its first exhibition at the Kunstsalon Pisko later that fall. During most of 1909, Schiele remained firmly under Klimt’s influence--he even referred to himself as “The Silver Klimt.” Not just his use of metallic pigment, but the gestures and linear stylization of his compositions bound the younger artist to the master. Schiele would retain from this phase a reliance on taut, emotionally charged line and an acute awareness of negative space, but in 1910 he abruptly abandoned all Klimtian decorative pretenses. Stripping his figures of any mollifying aesthetic context, he set them adrift in a pictorial void that served as a visual correlative for existential uncertainty. Schiele turned up the pitch on his previously harmonious and muted palette, juxtaposing vivid slashes of green, orange, yellow and red with masterly abandon. This stylistic shift emerged most significantly in a series of nudes done during the early months of the year: females (often the artist’s favorite sister, Gerti) cowed by the discovery of their emergent sexuality, and males (probably the artist himself) reveling in the force of a raging libido. Schiele’s professional prospects prospered apace in 1910. The 1909 Pisko show had brought him the support of the critic Arthur Roessler, and through Roessler he soon attracted an impressive array of patrons. Direct patronage of the arts--which flourished longer in Vienna than elsewhere in Europe due to a dearth of commercial galleries--facilitated portraiture, and it is not surprising that Schiele’s output in this genre surged during 1910. In the portraits executed toward the second half of the year, one sees for the first time the influence of his compatriot Oskar Kokoschka. The scraped, primitive surfaces and relatively subdued hues of these works constitute a decisive break from the exuberance of the period immediately preceding. Despite (or perhaps because of) his newfound success, Schiele grew increasingly disgusted with Vienna and in particular with the infighting that afflicted the Neukunstgruppe. He retreated repeatedly to the Czech town of Krumau, first in the summer of 1910, again that autumn, and finally in the spring of 1911, when he thought to settle there permanently. Krumau, his mother’s birthplace, would become the artist’s most important landscape subject. In its narrow streets and ancient medieval walls, Schiele saw a metaphor for the simultaneous decay and persistence of human existence; he called Krumau “The Dead City.” The densely packed geometric forms of the Krumau townscapes (which passed, in Schiele’s mind, for Cubism) contrast noticeably with the spare compositions of his figural work. Yet both genres are marked with a pervasive sense of impending doom. Finally cured of his penchant for small-town living, Schiele returned to Vienna in May 1912. His career seemed to be foundering: a one-person show at the Galerie Miethke the previous year had no immediate impact, his Munich dealer, Hans Goltz, was becoming discouraged, and many of the artist’s early patrons were falling by the wayside. Despite or because of these setbacks, Schiele embarked on his most ambitious works to date: large allegories that summed up his philosophy of art as the antidote to death, and the artist as spiritual leader. Unfortunately, this entire series of paintings has been lost or destroyed, but the related drawings--less ponderous and therefore fresher--fairly reflect the path toward enlightenment through martyrdom and expiation that Schiele believed himself to be pursuing. His landscapes from this period are dominated by evocative “tree portraits,” wherein frail saplings, rising from barren soil and staked against a hostile wind, stand in for the artist’s battered psyche. Playing the martyr was for Schiele less an exercise in self-pity than a means of triumphing over adversity and atoning for his shortcomings. He was actually becoming less self-absorbed, more outward-looking, and ultimately more conventional. Perhaps the clearest sign of this reversion to his middle-class origins was his decision, in 1915, to throw over the loyal but wanton Wally and marry the chaste, bourgeois Edith Harms. Schiele’s induction into the army helped hasten the wedding; he reported for basic training three days thereafter. The Austro-Hungarian Army in World War I made a surprising effort to shield artists and other intellectuals from active service, but Schiele was initially unable to secure such special treatment. For a time, he dug trenches or guarded prisoners on the outskirts of Vienna, and then, in 1916, he was transferred to the offices of a military prison in the rural hamlet of Mühling. Only in 1917, when he was assigned to perfunctory duties at the Military Supply Depot in Vienna, was Schiele able to properly resume his artistic career. The Schiele who in 1917 emerged from a comparative creative hiatus of one-and-a-half years was a changed man. The experiences of war and marriage had sensitized him to the feelings of others, imbuing his portraits with far greater poignancy and emotional objectivity. For some years, he had been groping his way back toward more fully modeled forms and smoother, less anguished contours. His late drawings betray an almost classical realism that may be a belated homage to his once despised academic training. Paradoxically, however, as his drawings became more subdued, the painterly abandon of his oils increased. 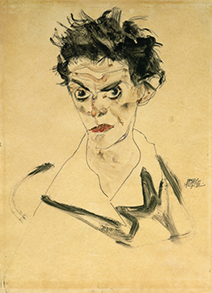 Whereas many of his early paintings had been structured like large drawings, the pigment mimicking watercolor or gouache, Schiele had finally learned to appreciate the qualities unique to oil. In their masterful deployment of bold impasto, his last paintings are technically his most typically Expressionistic. By 1918, Schiele had achieved an enviable harmony in his art and life. No longer the tortured adolescent, he had learned to accept his place in society. Though their marriage was less than idyllic, he and Edith were expecting their first child. Schiele had also made great professional strides, and after a sell-out exhibition at the Vienna Secession in March 1918, he was widely acknowledged as the nation’s leading artist. Schiele was at the height of his career when in October of that year, he and his pregnant wife succumbed to the raging influenza epidemic then sweeping the world. Though the death of the twenty-eight-year-old artist was indeed tragic and premature, his legacy nonetheless reveals a surprising completeness and organic unity. It was perhaps ordained that Schiele, the quintessential adolescent artist, should die upon reaching maturity.